Up to the iPhone 4, 4 digit passcodes could be brute-forced within a short amount of time – maximum 30 minutes, depending on the passcode. With the iPhone 4s, the Boot ROM vulnerability required to upload a custom RAM disk has been closed thus rendering newer phones immune to this attack. This is where the IP-Box comes in. The IP-Box is small box which can be ordered with various adapters for iPhones up to the iPhone 6 (Plus). 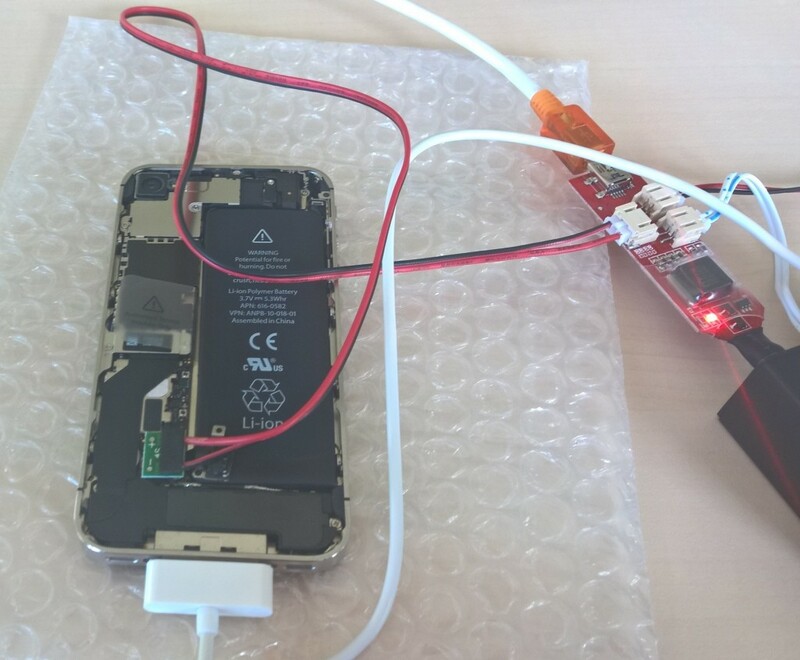 The device is powered by the iPhone battery and has a light sensor to detect if the iPhone has been unlocked. The box comes at a price tag of around CHF 250, including the iOS8 adapter. While there is only sparse documentation available for the box itself – most of it being in Chinese – Detective Cindy Murphy from the Madison Police Department created a manual which serves as an excellent starting point (iP-BOX: Breaking Simple Pass Codes on iOS Devices). There are several modes of operation for brute-forcing the passcode. Besides the obvious sequential counting from 0000 to 9999 or from 9999 to 0000, the software allows for different pattern-based attacks – i.e. birth dates, patterns or ordered lists – slashing the time needed to crack the code. Compass Security ordered the Box and tested if it lives up to its expectations. The hardest part of cracking the passcode was actually opening our test devices where the iPhone 5 actually resulted in a broken suction cup. The first test subject was an iPhone 4 running iOS 7.1.3. For iOS 7 the device luckily does not need to be opened, the IP-Box and its light sensor can be attached and the device is ready to get pwned. The passcode can even be cracked if the phone is in the disabled mode. This state normally would no longer allow manually entering passcodes and requires the iPhone to be connected to iTunes to get it back to a working state. We set the “Each group of data interval (ms)” to 4500 while leaving the “Stop while the brightness changes” and “Each time interval bit (ms)” at their respective default settings. We found that faster passcode guessing rates lead to unsuccessful passcode tries. With the above settings the box managed to enter 1 passcode per 6 seconds which means that in the worst case, cracking a 4 digit passcode would take about a day on an iOS 7 device. As our video shows, the IP Box was not overly impressed with the fact that the iPhone 4 was disabled. The second and third test subjects were an iPhone 4s and an iPhone 5 each running iOS 8.1. This is the last version currently supported by the IP Box. With iOS 8 a special adapter is needed and the device needs to be opened in order to disconnect the iPhone’s battery and connecting the IP-Box directly to the power connector of the device. 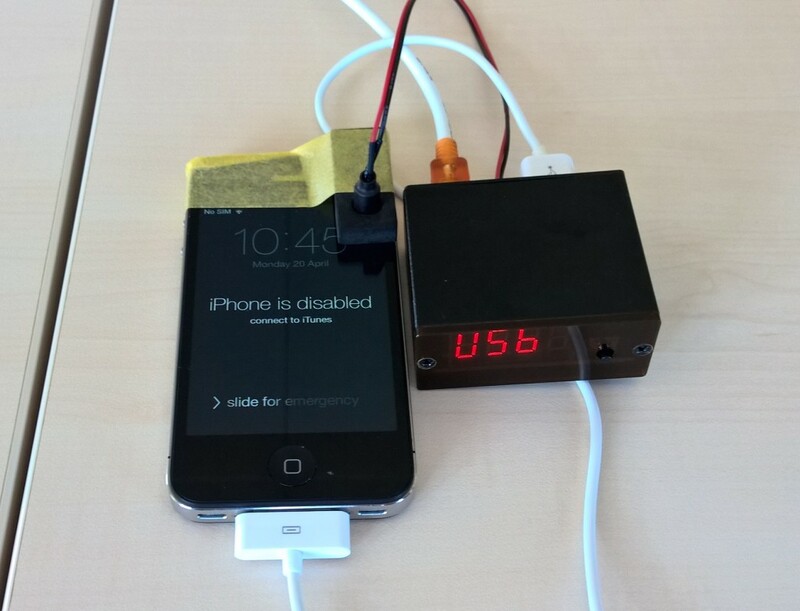 This setup allows the IP Box to aggressively cut the power supply, preventing the iPhone from increasing the counter on failed passcode attempts. Since the iPhone restarts after every passcode guessing attempt, in addition to the parameters used on the iOS 7 device, a startup power delay needs to be configured. In our tests we chose a delay of 15 seconds, but the delay could be decreased to 7-8 s, since the IP Box is only powered on, when the iPhone is running again. 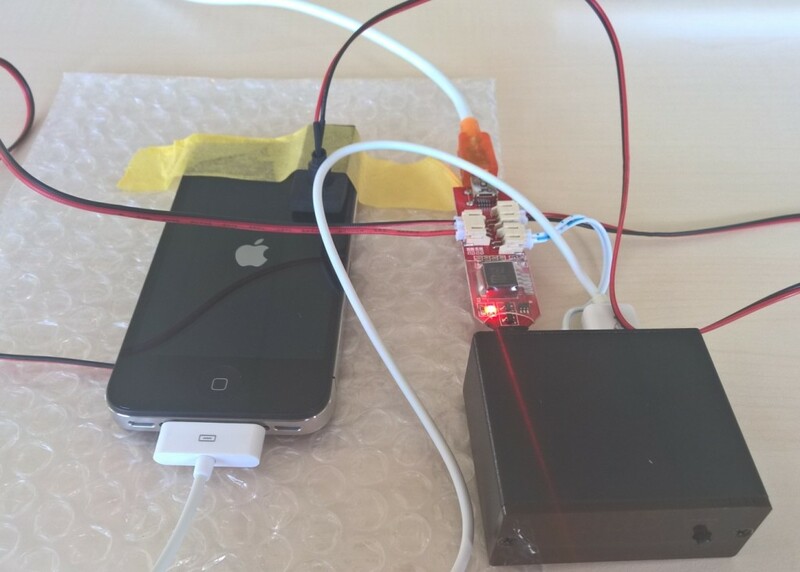 Brute-forcing a 4 digit passcode on an iOS 8 device will thus take between 3.5 and 6 days depending on the hardware. Unlike iOS 7 where a phone can be disabled and the retrieval of the passcode is still possible, iOS 8 does no longer allow brute forcing the passcode on a disabled device. So make sure not to manually enter codes before unleashing the IP-Box on the iPhone. Our tests lead to the conclusion that a 6 digit passcode already greatly improves the security of your iPhone. Running iOS 8 on a modern phone it would take about a year in the worst case to retrieve the passcode compared to the 3.5 days of the 4 digit code. If you are using a passcode with numbers and special characters while avoiding words from a dictionary or personal data such as the birth date, name, address or similar, it is currently virtually impossible to retrieve the passcode within a reasonable time frame. This blog post resulted from internal research which has been conducted by Michael Fisler and Cyrill Bannwart in April 2015.